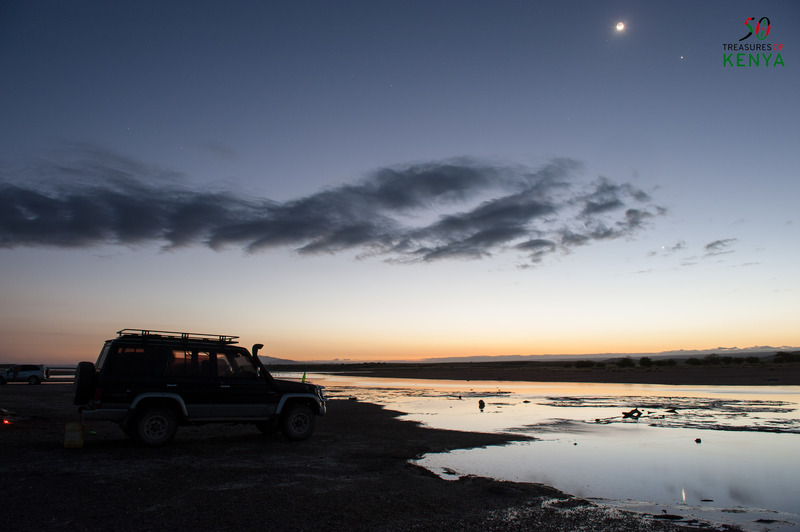 Moon shine at Lake Magadi. 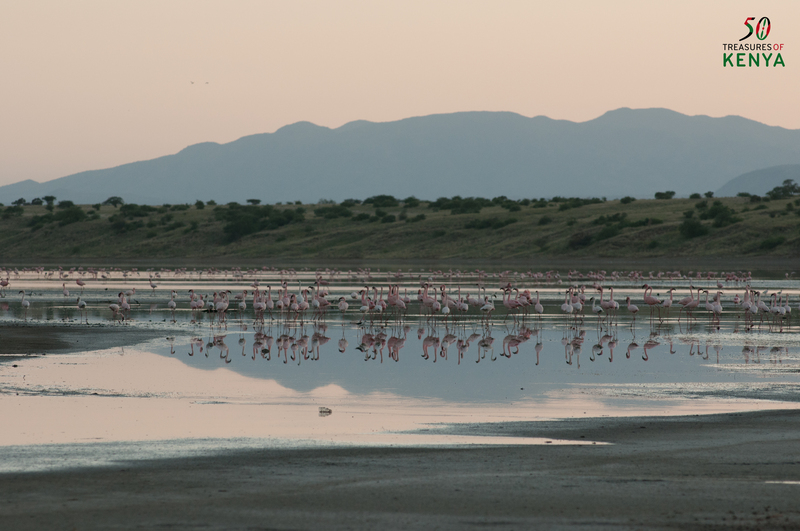 Deep in the heart of Southern Kenya’s Maasai land in a catchment of faulted volcanic rocks north of Tanzania’s Lake Natron is the unearthly Lake Magadi. This 104 sq km alkaline lake is an example of a “saline pan” and is the most mineral-rich of the soda lakes. It is almost entirely covered by a thick encrustation of soda that supports many bird species and gives the landscape a weird lunar appearance completely surrounded by vast natural salt flats. The general landscape in the pinkish mirror like soda lake is stunning because of the wonderful colors of its soda water and its bird life. The lake changes its color from brilliant white to cerise pink, cobalt, indigo, deep scarlet and soft pastels, according to changes in the light. Nevertheless some parts have turned bright green due to the profuse number of algae. These sweltering hot plains create a natural bird sanctuary preventing any predators from reaching the alkaline lake at its centre. 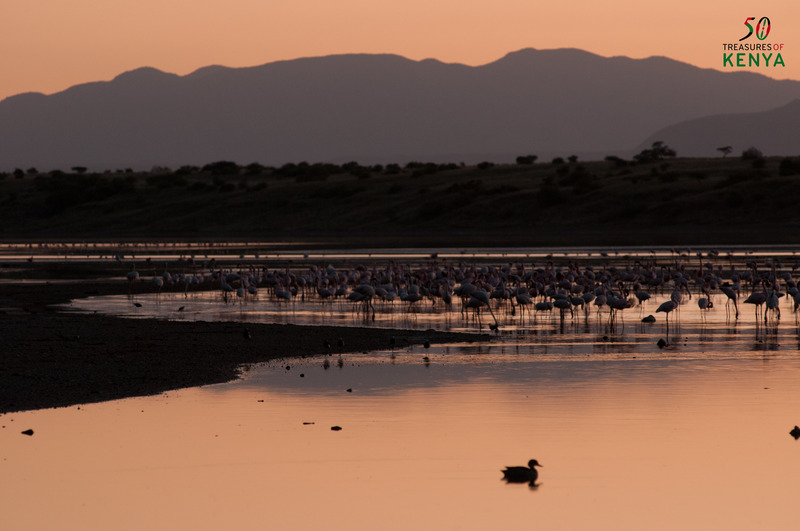 Lake Magadi is also well known for its wading birds, especially the flamingos. The flamingos are mostly found at the southern end of the lake, while the freshwater springs in the north attract a host of other bird-life that come to drink and clean themselves. Other species of interest recorded here include the African spoonbill, Cape Teal, Great Egret and the Avocet. A single species of fish, the Graham’s Soda cichlid (Alcolapia grahami) also known as the Magadi tilapia, inhabit the hot highly alkaline waters of this lake basin and is commonly seen in some of the hot spring pools around the shoreline. Most of these hot springs lie along the northwestern and southern shorelines of the lake. The lake is recharged mainly by saline hot springs of temperatures up to 80°C that discharge into alkaline “lagoons” around the lake margins, due to the little surface runoff in this arid region. During the rainy season a thin layer of brine covers much of the saline pan, but this evaporates rapidly leaving a vast expanse of white salt that cracks to produce large polygons; in some places the salt is up to 40 m thick. 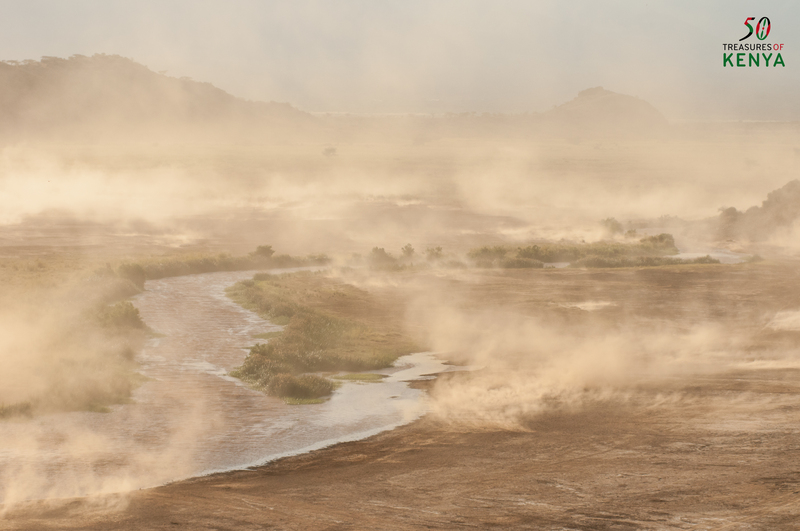 Magadi is often the final destination for treks from the Nguruman escarpment or the Loita hills. This elongated escarpment forms the western wall of the Great Rift Valley. 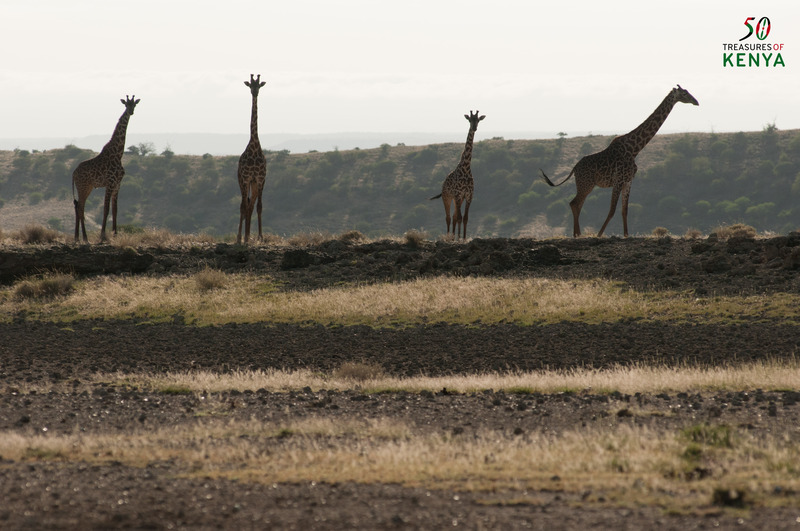 It is around 50 kilometres long with its northern edge approximately 120 km southwest of Nairobi, while the southern edge is near the Tanzanian border. The valley floor is about 900m above sea level, while the elevation of the crest of the escarpment is about 2300m. Below it are the vast plains and the volcanic hills of the Great Rift Valley and in the distance are Lake Magadi and Lake Natron. 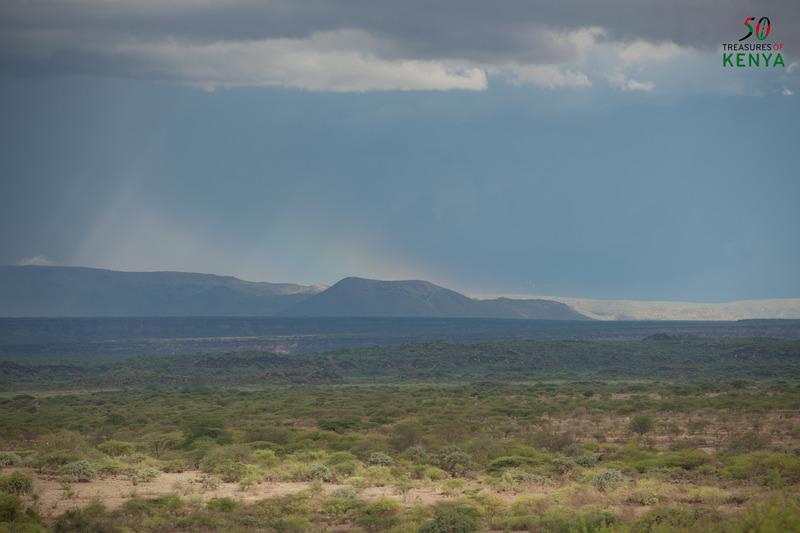 The edge of the scarp provides a splendid panorama of the Rift Valley. 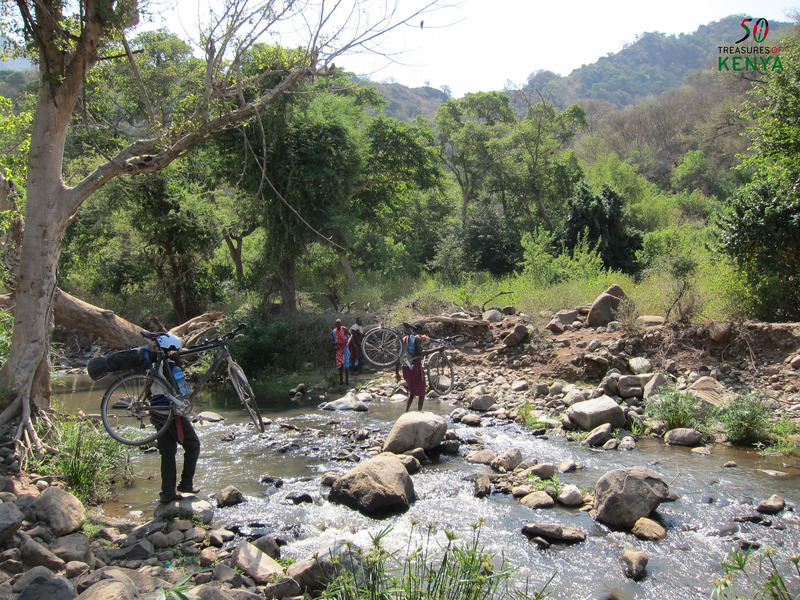 Crossing Ewaso Ng’iro on the way up the escarpment. 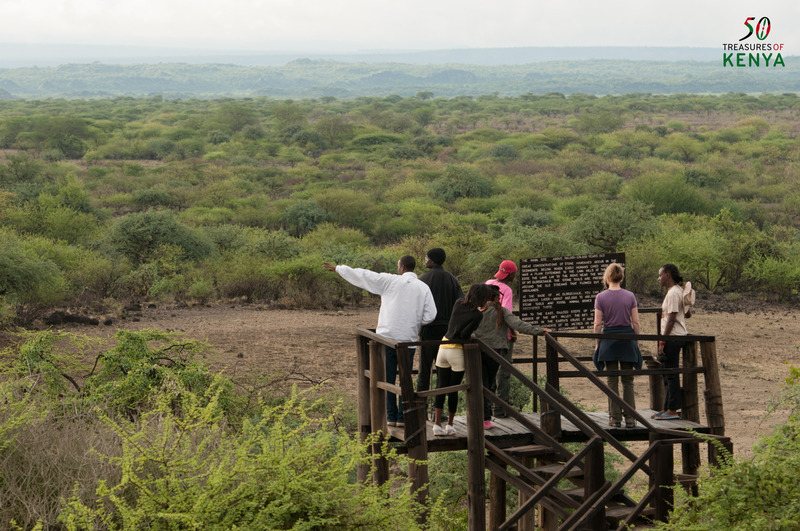 As you ascend higher, you get amazing views of Ewaso Ng’iro river and of the settlements below surrounded by various hills. 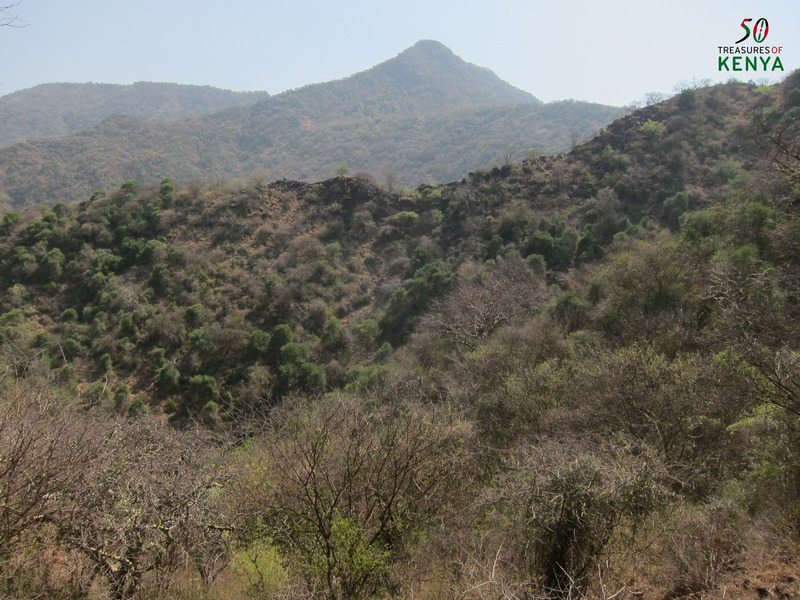 The vegetation varies from an open woodland area to dense thicket on the lower slopes of the escarpment with a flatter area of grassland, acacia forests, wild bush and streams cutting across this area before plunging a final 700m down the scarp to the hot and dry floor of the Rift Valley as they flow through unique and enchanted riverine forests. Some of the permanent residents of the South Rift. This region is a haven of over 300 species of bird life, and has a vast variety of wildlife such as antelopes, cheetahs, zebras, lions, leopards, monkeys and giraffes. 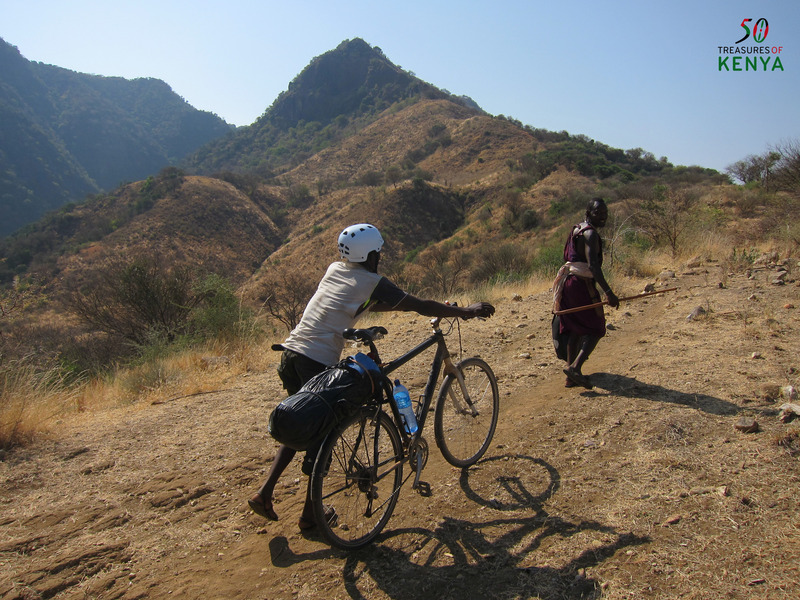 Cycling up to the top of Nguruman Escarpment. The trail levels off briefly only to get steep again as you make the final push to the vicinity of the waterfalls. 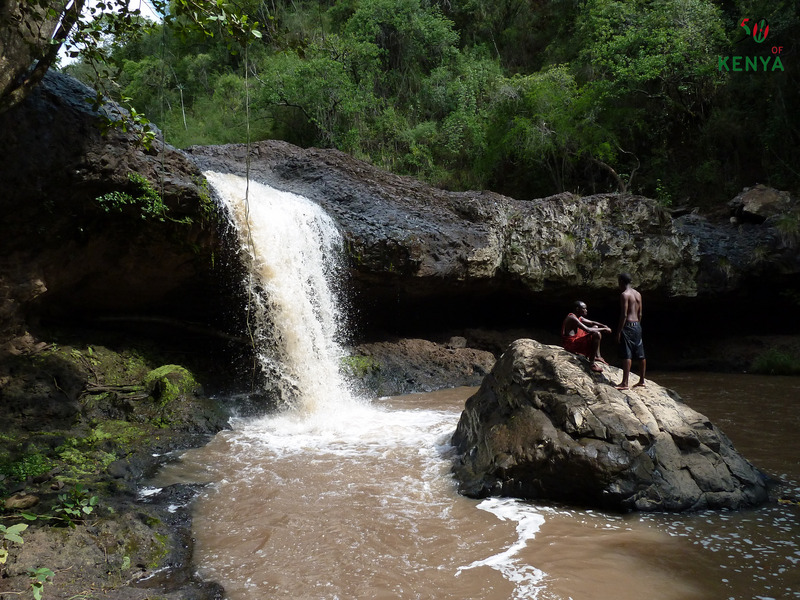 This route apparently goes all the way to Maasai Mara, so as you approach the waterfalls, you will get off the trail at some point and go down a sharp vertical descent of about 10m through forest undergrowth to access the river and waterfalls below. The water pools beneath the first two shelves of the waterfalls offer excellent swimming opportunities to cool off while enjoying the marvelous scenery. The “Stone Tool Factory” at Olorgesailie. 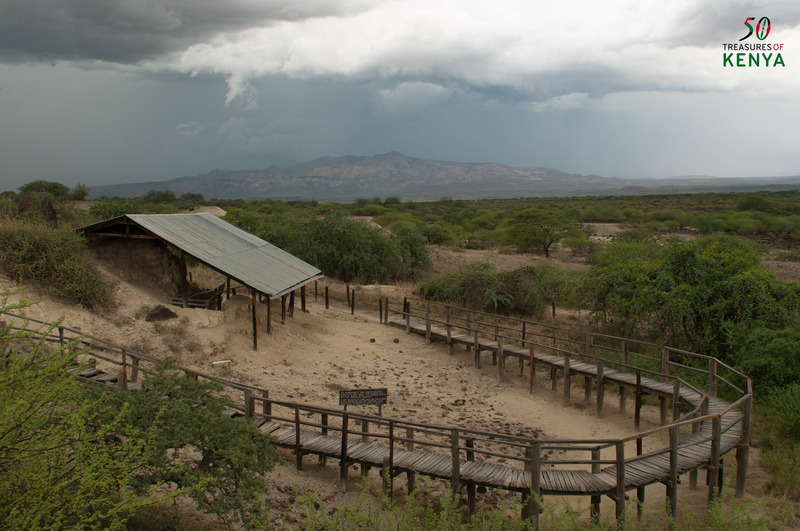 Another attraction approximately 50mins away from Lake Magadi is the intriguing 50 acre archeological site on Magadi Road about 52km to the north east of the lake. 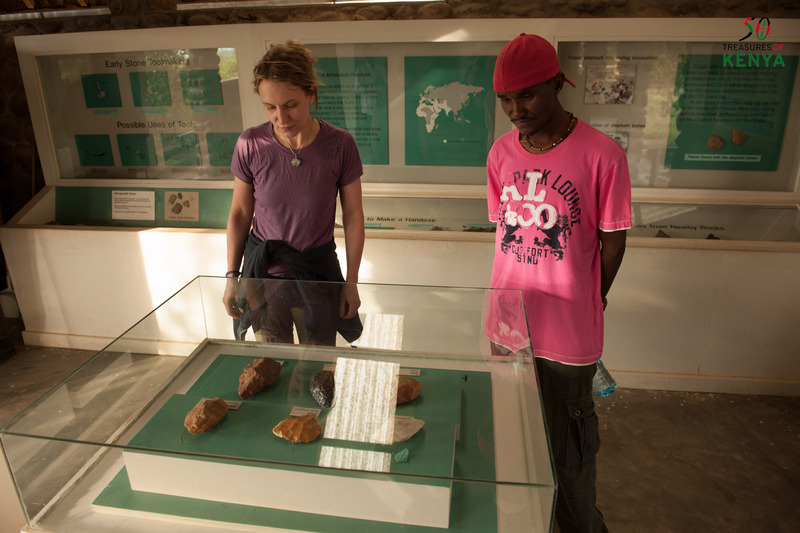 World renowned as the “factory of stone tools” and the only place on record possessing an impressive number of Acheulean hand axes and the largest stone tools, the site gives evidence not only of local importance but also of international significance. Breathtaking view of Mt. olorgesailie from the Museum site. Can you see the rainbow? This geological formation is situated between Mt. Olorgesailie and Oldonyo Esakut which are both volcanic in origin. The area is in a lake basin that existed during the latter part of the middle Pleistocene period probably between 200,000 and 100,000 years ago. It has excellently preserved biological and cultural evidence about the evolution of man. 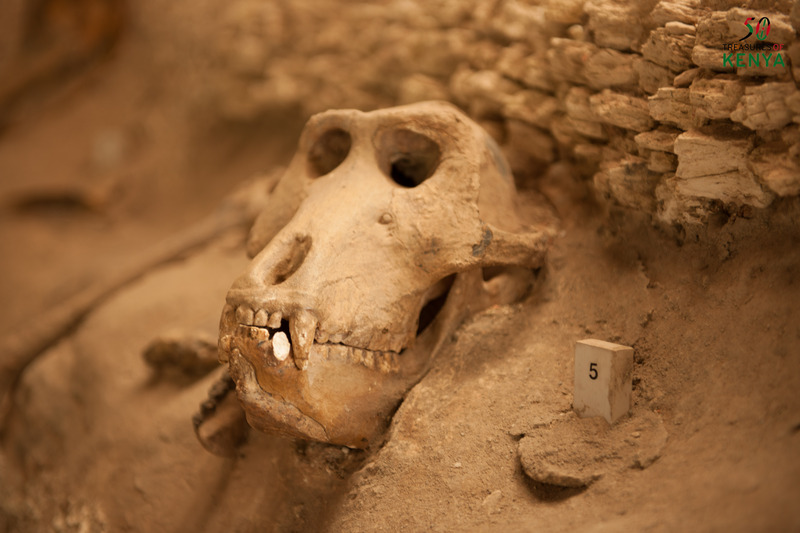 One can also find fossils of extinct species of hippos, elephants, zebras, giraffes and baboons. This site provides some evidence that the human species had a tropical origin and a higher primate group was confined to this part of the world. The hand axes were preserved possibly by the heavy downpour of alkaline ash from the volcanic activities around the site. There is evidence of humid climate during part of the middle Pleistocene age that is given by the temporary lakes and swamps that exist in the area today. The sediments left by the lake cover an area of about 130km2 in extent. 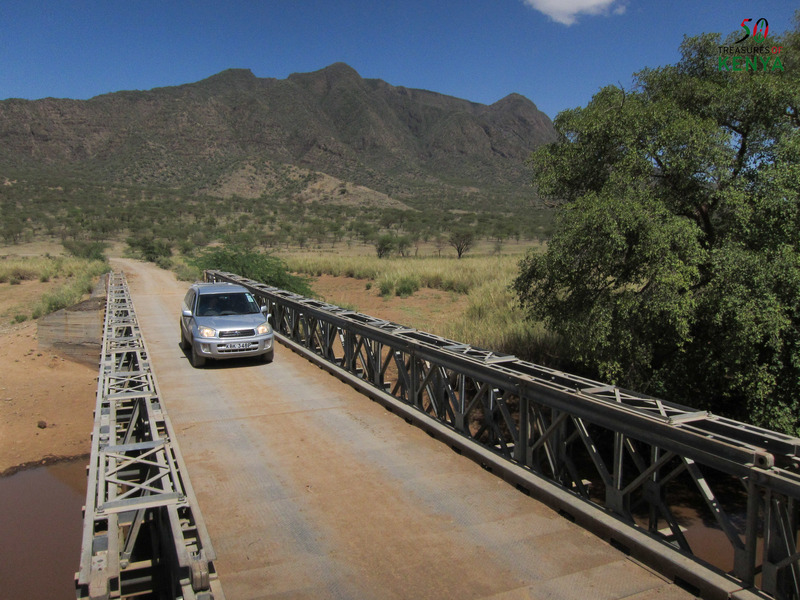 Private vehicles are the best way to access Lake Magadi and Olorgesailie. 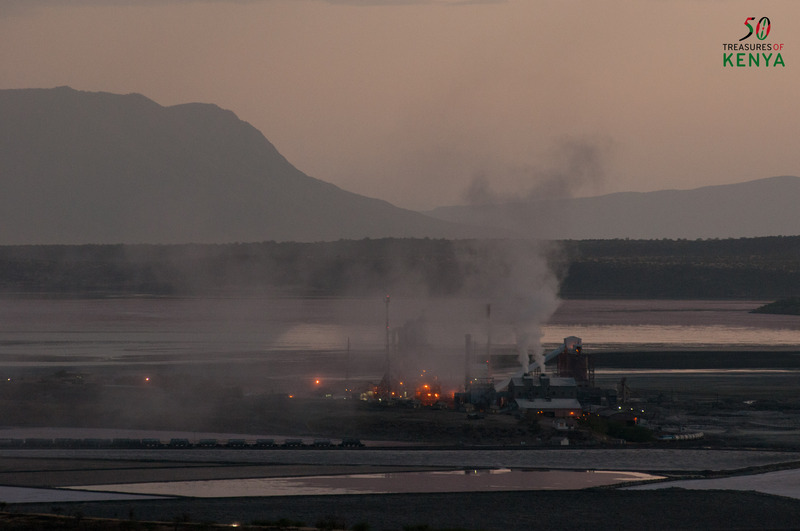 The Magadi township lies on the lake’s east shore, and is home to the Magadi Soda factory, that produces soda ash, which has a range of industrial uses. 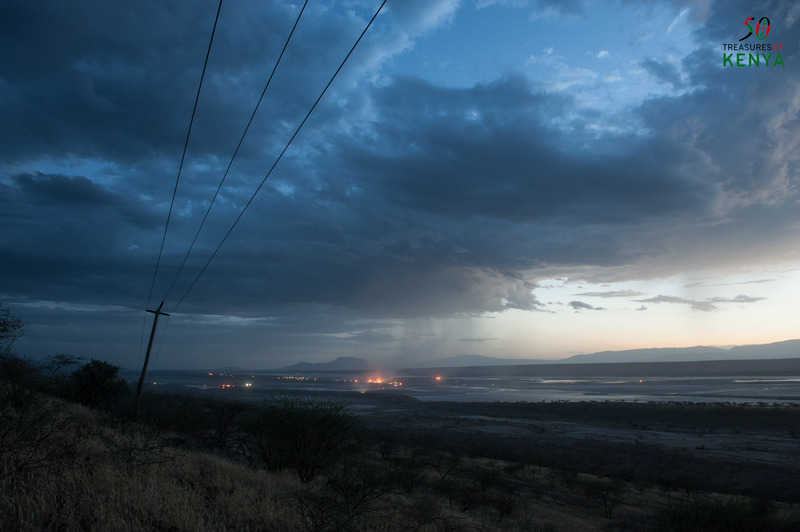 The main road access to Magadi is directly from Nairobi by bus, matatu or private transport, via Kiserian. 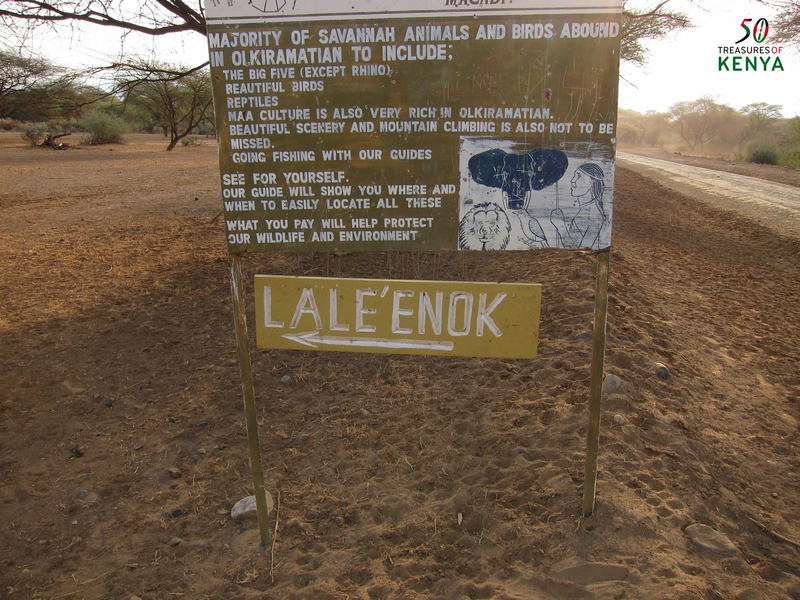 Many trekkers hike to Magadi from the Nguruman Escarpment and the Loita Hills. Only one bus service, Ostrich Services, operates between Kiserian and Nguruman once a day if you plan to get there by public transport. It leaves Kiserian late in the afternoons, arriving at Entasopia Market in the Nguruman area in the late evenings hours. For the adventurous, you can brave a ride on the pickups or lorries ferrying goods between Kiserian and Nguruman. If driving from Nairobi, you’ll need a 4WD vehicle with a good clearance. Take Lang’ata Road till Bomas of Kenya and turn left onto Magadi Road. Drive past the Magadi Soda Factory where the tarmac road gives way to a dirt road. A causeway which crosses the lake provides access to the Nguruman Escarpment to the west of the lake. 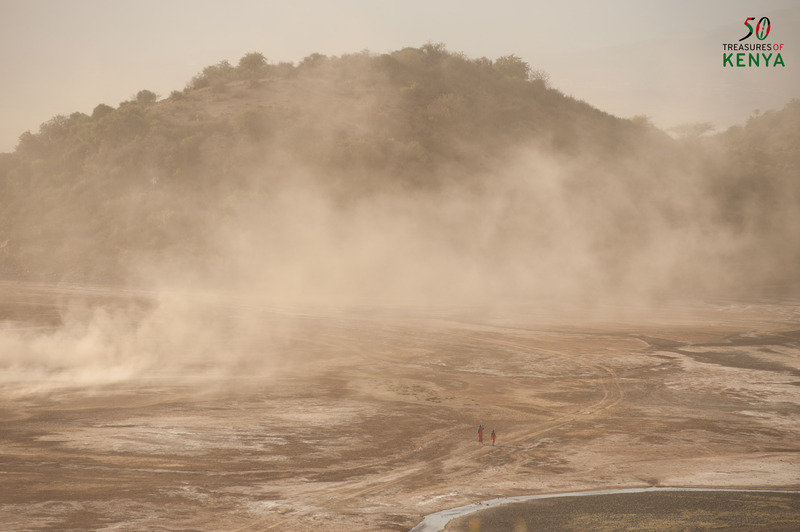 This road crosses Lake Magadi at some point, and then climbs back onto the dusty semi-arid plains where it weaves its way until the foothills of Nguruman Escarpment. There are a range of lodges and hotels around Magadi town where one can opt for more comfortable accommodation. 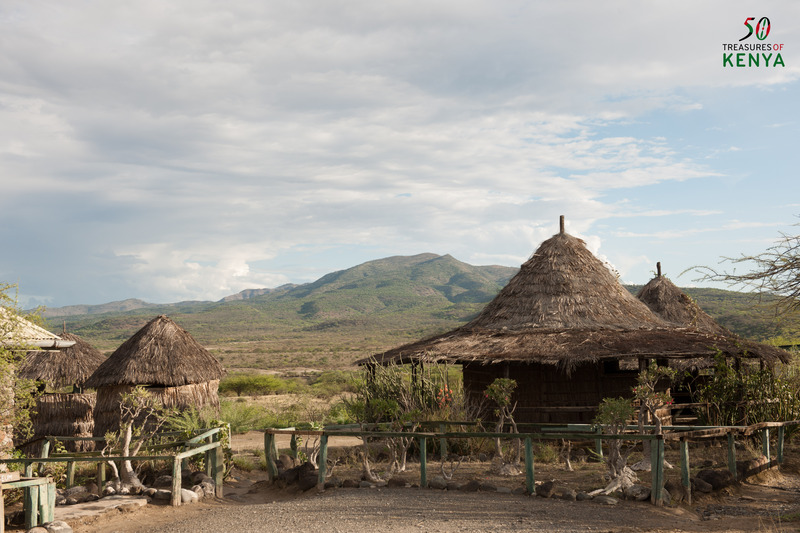 Although there are sections of the escarpment that is privately leased for development of luxury tourism, the indigenous Maasai community own and farm the land on the escarpment and hills. 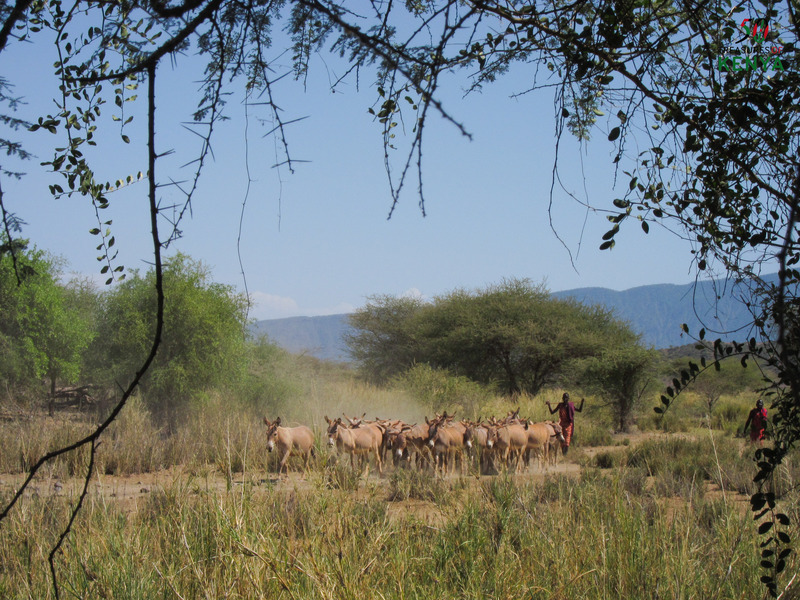 Shompole and Nguruman Group Ranch, set at the foot of the Nguruman Escarpment, are some of the several ranches that have been set up by the cattle herding Maasai community, and cover a section of the Rift Valley between the soda rich lakes of Magadi and Natron. Visitors can spend time to discover and participate in the authentic and traditional lifestyle of the Maasai culture. 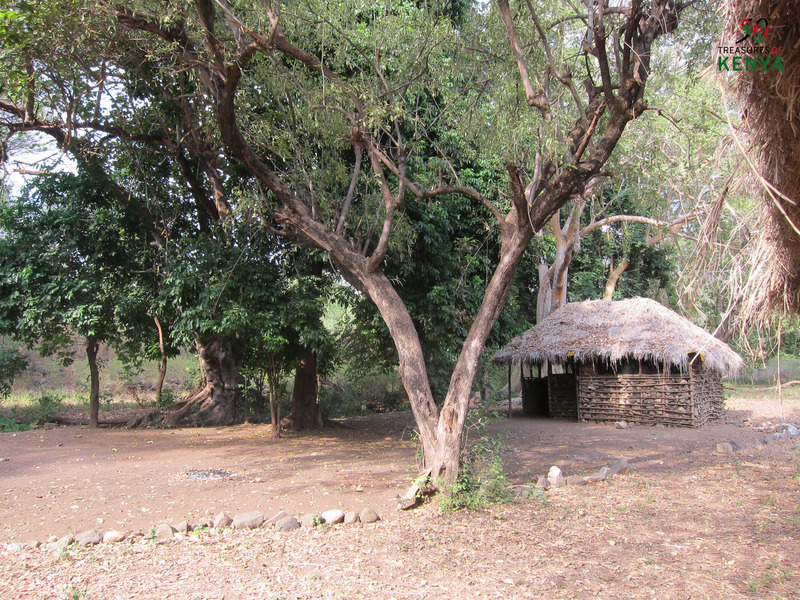 Several lodges are located in the area which is part owned by the local Maasai people. Camping by waterfalls and swimming in deep pools creates a total contrast to walking through the dry bushland beyond their confines. The Nguruman ICIPE Research Centre provides accommodation facilities with showers and meals. If you call Joseph Saningo (+254(0)715 648192), the caretaker for this Centre at least a week in advance, he’ll make the necessary arrangements for you. He’ll also make arrangements for a local guide for your hike. Another alternative is Cool Waters Camp, who have tents setup on a riverbank, and can arrange for meals on request. Call Sam, the Camp Manager on +254(0)727 469373 to make bookings, or ask Joseph to arrange for you. At the Museum one can take a walk to see the actual site and the discoveries made here. It also happens to be a bird watcher’s paradise citing the highest number of migratory bird species in Kenya. One can go mountain climbing at Mt. Olorgesailie. On average it takes 3 hours to ascend and the same to descend, the best time to do this is from 5:00 am. 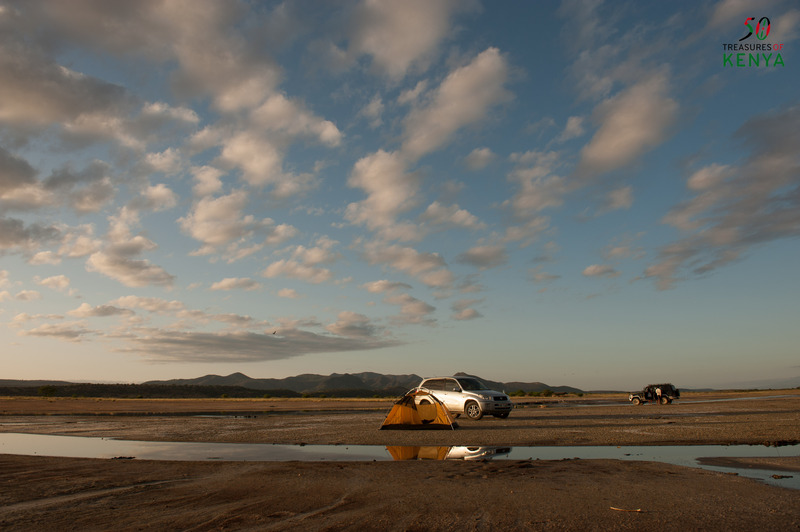 Affordable accommodation facilities, picnic and camping grounds are available at the Olorgesailie site. The rates are; Banda Capacity- 4 doubles (Kshs. 800), 4 single/ twins (Kshs. 500) per day. Camping: Kshs. 250/- per person, per day. There are plenty of activities to do at Olorgesailie apart from visiting the museum and sites to see the discoveries. Nature lovers can indulge in some bird watching , go trekking, camping or picnicking and the more adventurous can try hiking at the mountains nearby. 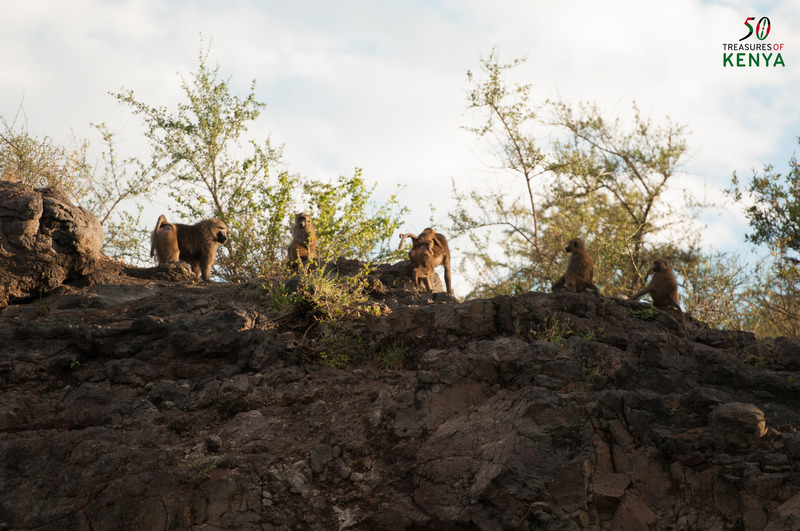 Or visit the Baboon camp in the evening. It is about 1 km from the campsite. The Museum opens daily at 8:00am- 6:00pm. We trust that this has been informative to you. Take it a step further and spread the message: like it, share it, Like us on Facebook, Follow us on Twitter and stay posted for the next Treasure. very educative information.Would like to visit the places. Much appreciated Ndungi, we are happy if the features are useful in any way. Please continue to follow our countdown as we share with you some of Kenya’s marvels and treasured attractions. I will be bringing 120 primary school children on 12 july 2013.please advice me of more places of interest in which they can visit around. …sorry for not getting back to you in earlier,we still hope that we can be of assistance to you. Regarding you query about other places of interest in the South Rift,kindly contact Joseph from the Masai Community Campsite Hot Springs and Conservancy,on phone no. 0701-698052.He should be of better assistance and further information. All in all would also like to wish you the best and always remember toTreasure Kenya. I’ll make sure to bookmark it and return to read more of your useful info. Thanks for the post. I will definitely return. You are most welcome.We really appreciate your enthusiasm and continue to encourage you to read up on the other Treasures we have highlighted the past weeks.Feel free to also share any suggestions you may have with us regarding Kenya’s wonderful attractions.Until the next time then. Hi, I do think this is a great blog. I stumbledupon it 😉 I’m going to return once again since i have saved as a favorite it. Hi guys. Really loved your post. will be visiting the place in a month so the information has been really helpful. Keep up the good work and i’ll dfntly be back. We are always happy to hear how we can improve and make your experience in Kenya even better. Please Like our Facebook page 50 Treasures of Kenya, Follow us on Twitter @50Treasures #TreasureKenya for more.